January 23rd, 2016 -- GREAT to see Dave Keon back with the Leafs. A few years ago I presented to Dave, at the Hockey Hall of Fame, over 1600 signatures from fans in support for Dave to agree to have his number retired. At that time Dave asked me to stop promoting his number to be retired because he did not like the Leaf's organzation. He did thank me for doing the web site and we parted ways. The situation felt hopeless to me so I basically gave up trying to convince Dave. I was hoping my efforts based on fan support would have been the catalyst to making this happen. I guess everything happens in it's own time. 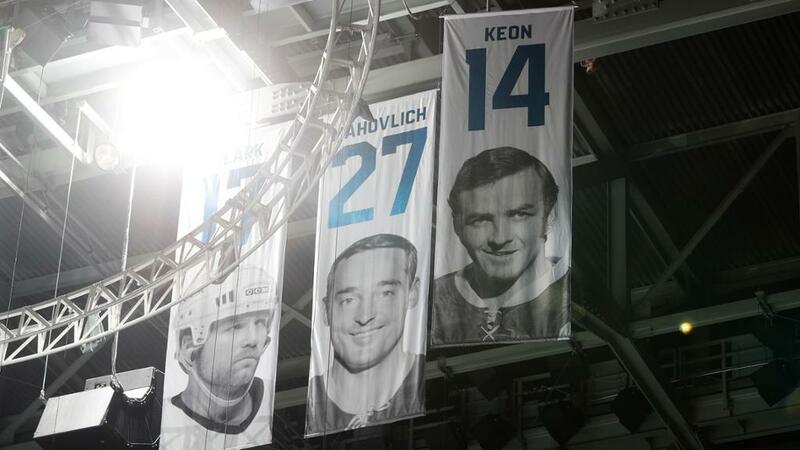 I along with thousands of Dave Keon fans across the globe we can now rest in the fact that Dave is once again a Leaf and a shrined one forever on Legends row. 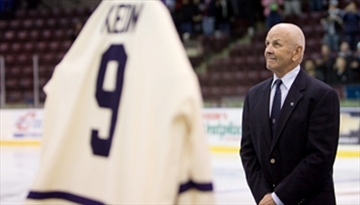 Hockey great Dave Keon has number 9 retired. Dave Keon stood and watched as his No. 9 sweater is retired by the Mississauga St. Michael’s Majors at a ceremony at centre this afternoon at the Hershey Centre. A good portion of the 2,708 spectators at the Hershey Centre weren’t aware of who Dave Keon was until yesterday afternoon. In fact, most of them weren’t even born when he launched what would become a legendary hockey career a half century ago. But that didn’t interfere with their enthusiasm as they gave the 68-year-old Keon three standing ovations during a 30-minute ceremony at centre ice that included retiring the No. 9 jersey he wore when he first played for St. Mike’s back in 1958. He becomes the first player in the history of the organization to have his jersey retired. “This is pretty special,” said Keon, who graduated from the Majors in 1960 and went on to a 23-year professional career that included 15 seasons with the NHL’s Toronto Maple Leafs. He also played for six seasons with three teams in the now-defunct World Hockey Association. There were tributes from the mayor of Mississauga, Hazel McCallion, the commissioner of the Ontario Hockey League, David Branch, and the owner of the Majors, Eugene Melnyk. Among the gifts Keon received was a gold pocket watch from the Majors. “You brought a profound and positive influence to our game,” Branch said of Keon. Keon scored 73 goals and added 97 assists in three seasons with St. Mike’s and then went on to an illustrious career with the Maple Leafs before joining the WHA. He was regarded as the most gentlemanly player of his time in the NHL and twice won the Lady Byng Trophy. He was awarded the Calder Trophy as the top NHL rookie in 1961. He had 396 goals and added 590 assists in 1,296 NHL games. He also played 301 games in the WHA, scoring 102 goals and 189 assists. Keon, who now resides in Palm Beach Gardens, Fla., has been at odds with the Maple Leafs for nearly three decades over various issues. The topic was never raised during Sunday’s activities. The decision to retire Keon’s number meant defenceman Tim Billingsley had to give up the No. 9 jersey he had worn since joining the Majors for the 2006-07 season when the team was based in Toronto. He has now switched to No. 6. "give me nine Dave Keons and I will win you a Stanley cup every year". "Keon may have been the best two way player the game has ever seen!" "I don't know any player who did as much damage to the Montreal Canadiens as Dave Keon." These fans signed the petition and made great comments !! # 193. Gerry Willan... "I truly don't believe the cup will return until Dave does." # 216. John Trost... From the Toronto Telegram circa 1970 ....... "how do you get the leafs started ?" Turn the KEON !! # 299. Barry Plashka - I'm a Habs fan, but Keon's why I like hockey . # 309. James P. McFadden - My favourite player - ever! His hockey card was one of the few that never went in my bicycle spokes! # 426. Kevin Trevor-Wilson I just rec'd my Hockey News this week and got to thinking about the wonderful years at MLG sitting in the corner Blues watching Dave. I copied all his skating moves and had a backhand like no other teammate in my playing days. One of my greatest thrills was the time I was playing in the Ontario Father/Son Golf tournament and was playing right behind Dave and his son. I couldnt believe my eyes. I always had my Dave Keon jersey on for the games I went to at MLG. Each Christmas , if I needed a larger size , Dad would purchase at Doug Lauries. I sure do miss those wonderful times. I would cry like a baby if the time came that Dave's number would be retired and he would step out on the ice to receive what has Leaf fans have been storing up to bestow upon him for years. What a wonderful idea this page is. # 447. Alisdair Mackay - The only person to skate as good as Keon was his shadow. He was very skilled in many aspects of the game. # 474. Keon Bishop - Dave Keon was the best leaf player ever and I'm proud 2 be named after him. Here you go Dave. Other great reasons to have your number retired -- and I do mean retired forever !! # 906. Jennifer Johnson... "My son is only 5, but wanted to be #14 because his Uncle is. We always tell him what a great and honourable player Dave Keon was, and my son said he wants to be #14 too. Please Dave, generations of fans still idolize what you stood for, so please honour us with your presence at centre ice for The Maple Leafs once again!" # 1388. Fernie DaSilva - I'll never forget the sad day at Maple Leaf Gardens when I was competing in the elementary school Maple Leaf Track and Field games. It was just anounced that the Leafs signed Borge Salming and Inge Hammerstrom. I bumped into Dave Keon and asked for his autograph. He explained that he was too sad to sign anything, and promptly left the gardens. That night my dad told me that Dave Keon was no longer a Leaf. That was a very sad moment for all Leaf fans, including a young 13 year old who didn't understand the politics of the sporting industry. You could see the sadness in Mr. Keon's eyes that day. # 1538. Dar Cullihall - Growing up down here in Rocky Harbour, NL in 1967, we didn't have television, but, oh, how I remember listening to that final series between the Montreal Canadians and The Toronto Maple Leafs on our old, Rogers Majestic radio! Ours was a house divided: three of my brothers cheering for the Montreal Canadians while two of my sisters and myself cheering for the Toronto Maple Leafs. The joy, the joy when Toronto finally won that fourth game, winning the series and the stanley cup in six games. Alas, there have been moments of joy since, but not many. I remember Dave Keon so well! I had a Toronto Maple Leaf jersey with the number 14 taped on the back and my every move on the old frozen marsh was, in the mind of a youth, a Dave Keon move, especially that backhand he liked to use so much. It makes me so proud, now that I'm 55 years old, to see action being taken to have Dave Keon return to his rightful place among the Maple Leaf 'family'. I'm delighted to sign the petition. In the minds of many, Keon is the best player ever to wear the Maple Leaf. An entire generation of Leafs fans is aching to tell him that in some sort of ceremonial way. It would have been perfect at the closing of Maple Leaf Gardens last year. 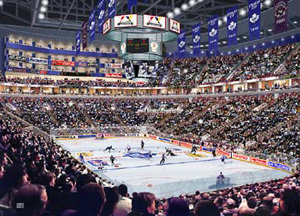 Or the opening of the Air Canada Centre. Or as part of the NHL all-star game festivities. Ballard is long gone. Most of Keon's old teammates, shunned during that distasteful era in Leafs history, have made their peace with the organization. But not Keon-and NOT his FANS !! Dave--please call the Maple Leaf organization and tell them you are considering plans to have your number recognized. Do it for your family-do it for your future generations and their pride in their relation to YOU. Like I said Dave ! # 92. Doreen Korman and Harry Korman - I have known Dave Keon since our youth in Rouyn Noranda and we have been season ticket holders of the Maple Leafs for 30 years. # 111. John Kernaghan (Hamilton Spectator) - Must hell freeze over before this happens. # 160. Gary Parkinson - I grew up In scarborough where the Keons lived.I went to school with Dave Jr. to St. Martin De Porres. I too always wanted to have #14 and when I did not get it well I chose #4 the best I could do. Everyone in Toronto knows Dave deserves to have his # high above in the rafters. His son Dave works in the ACC and Tim the other son you know would love to have this honor. Do the Keons proud and honor him in the way Ballard never did. -Whitby Ontario. # 201. Callum Wilkie - My PaPa has the greatest stories about Davy Keon as he played with him in his young years in Noranda, Que. Please come back to us. # 202. S. Wilkie (nee: Ouimet) - I've seen his signature on my parents marriage certificate, sat throught his and my dad's newspaper clippings of their days in Noranda, we know he is the greatest. # 420. Laura Nemett - "Dave Keon is my grandpa. I am proud of him!!!" # 464. Jake Iunghuhn - my dad goes fishing with DAVE KEON and my dad says he is the coolest guy ever. I dont know him but I want to know him sssssoooooo badly, I hope Dave's number gets retired because dave is my NEW and BIGGEST hero...GO DAVE...and the leafs. # 518. Dave Kennedy - My uncle, Vince Thompson coached Mr Keon in Noranda for years and was the man who scouted him to the Leafs organization. I have heard many stories of his sportsmanship and outstanding play. I think the retireing of his #14 would be great for the Leafs by bringing back memmories of class, grit , and an outstanding players style who helped to hold Lord Stanleys Cup as a satr in 1967 the last time the leafs won the cup. A new rink, new mangment, new system and the memmories of #14 would bring back some much needed class and sportsmanship to the NHL and sportsworld in general let the kids know heroes of old could be people to respect and look up to. # 585. Steven Keon... "Some things are truly deserved." # 627. Holly Keon - "As a longtime Leafs fan and a member of his family, it would mean a great deal to all of us if the Toronto Maple Leafs adopted the tradition of retiring numbers." # 625. Eldyne Miller - "Great job for so many years, Cousin Dave!" # 635. Rick Keon - "Let's make the legacy official." # 646. Lynsey Keon - "Dave Keon is my Great Grampa's First Cousin." # 691. Dillon McGee - "Dave was a highly skilled player and one of the best Leafs ever. We have the same great-great grandfather, John Sloan who was also Tod Sloan's great grandfather." # 725. Bernie Morton - My grandparents Arseneau lived next door to the Keon's when I was young and I grew up with him as my hockey idol. Only now do I recognize how lucky I was to visit his home frequently, play steeet hockey with him and his kids, and be offered the Keon memorabilia that he gave. Hang #14 in the rafters! # 727. Brian Watters - "I am several years younger than my "cuz" and fondly remember his visits to my home when I was a young teenager. I never turned out to be much of a hockey player but always admired his skills and watched all the Leaf games evey chance I got just to watch Davey. Many years have passed and I have not seen him since the late 1960's and I understand he is living in West Palm Beach. Would sure like to pay him a visit and remenisce. He was and always will be a real classy guy and a true gentleman. B.W." # 793. Steve Hawkins - "Cause he's my uncle." # 820. Mike Clifford - My dad grew up with Dave in Noranda and when I started playing hockey I was awed by him, he was my hero and I always wore number 14 because I wanted to play like him. He was the greatest Leaf to ever put on the jersey, his number deserves to be in the rafters and his name associated with greatness forever. # 895. Wil Tighe - "I'm a third cousin of Dave"
# 937. Wayne Knox - I lived with Dave @ St. Mike's.... he was an even better person than he was a hockey player !!! # 1058. Christine Hillman - I think that my Uncle Dave would have no doubt whatsover to have his number retired, he represented a big part of the Maple Leafs hey day and wore his captaincy proudly..Matt Stajan may be a good player but no one else wears number 14 as well as my uncle did! # 1228. Mike Strobel(Toronto Sun) - let's bring davey boy in from the cold. # 1343. John A. Lentowicz I was born in Noranda Quebec, which coincidentally is the birth place of Dave Keon. His then Father in law-Ernie Hillman was my Dad's Mine Captain at the Waite Amulet Mines. Dave's mother taught my brother in school. I am a passionate Leaf fan today as a result of Dave Keon. My son is also a Leaf fan today and he always hears me tell stories about what a great backhand shot he had, and how he is the greatest Leaf ever to put on a Leaf uniform. All of my Leaf sweaters have number 14 on them, and they always will. # 1720. Mary Catherine Jerome -Mcleod - I went to school with Davey in Noranda and Marilyn Oshea and I were just reminiscing about you and what a terrific testimony you are to the home town. Ever hear from the Rudds? NOTE: The petition is NOT endorsed by Dave Keon...just us FANS !! Thank you FANS for your support for what I believed was a worthy endeavour. The Maple Leafs retire the number of a player only when his career is ended prematurely due to death or injury. 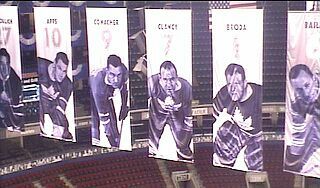 The first Leaf to have his number retired was Irvine "Ace" Bailey (# 6). 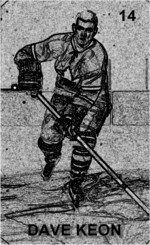 During a game at the Boston Garden in December 1933, Bailey was hit by Bruins defenseman Eddie Shore, arguably the fierecest player in the game at the time. Bailey was sent airborne and landed his head on the ice. He had a cut in his scalp that required sixteen stitches to close and remained in hospital for five weeks, seemingly with his life in the balance. Bailey eventually recovered but his hockey career was over. He went on to become the assistant penalty timekeeper at Maple Leaf Gardens for nearly fifty years. Ace Bailey was elected to the Hockey Hall of Fame in 1975. Bill Barilko's # 5 was the team's second number to be permanently retired after the defenseman died in plane crash only four months after scoring the winning goal in the 1951 Stanley Cup playoffs. A number that is retired can no longer be assigned to any other player. An honoured number may still be worn on an active player's jersey. Twelve Maple Leafs have proudly had their numbers honoured and their respective banners raised to the rafters at Maple Leaf Gardens during an induction ceremony into the Leafs Honour Roll. When a player's number is honoured, the active Leaf who has been assigned that number wears a special Leaf shoulder logo on his jersey. The Maple Leaf outline remains the same, but differs in that the name of the player whose number is honoured is inscribed into the crest of the maple leaf. The special crest is worn only for the duration of the season in which the honoured player is inducted into the Leafs Honour Roll. I took the liberty but it may just be a matter of time before this actually happens! Jumping ahead about seven years. Well it finally happened I wish Dave had invited me to the ceremony.